A convicted match-fixer who operated from a UK base yards from Wembley Stadium is at the centre of a major inquiry into a global corruption network that threatens the integrity of international football, an investigation by The Daily Telegraph has established. Wilson Raj Perumal, a Singaporean, has been the subject of inquiries by Fifa, national law-enforcement agencies and Interpol, who have uncovered evidence of fixers manipulating more than 300 matches. 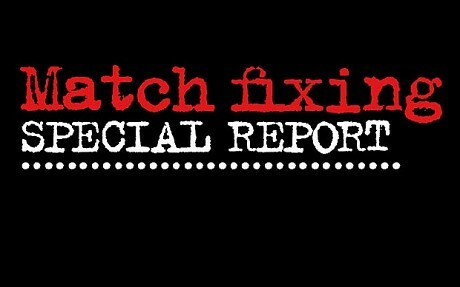 The fixers have operated on three continents planning and staging friendly internationals with the express aim of manipulating the results, as well as targeting hundreds of club matches across Europe. Investigators believe that match officials have been bought for as little as $10,000 (Â£6,000) per match to help deliver specific scores or events in games, enabling fixers to make hundreds of millions of dollars on Asian gambling markets. London is believed to be a crucial staging post in the fixing operation, with its role as a financial centre and a significant centre for betting, providing cover for the flow of funds through legal and illegal channels. Confirming the scale of the investigation, Fifaâ€™s head of security Chris Eaton, a former Interpol official, told The Daily Telegraph: â€œThe threat from match-fixing to the integrity of the global game is significant. England is the home of football and London is a global financial centre so it does not surprise me that the financial aspects of this activity lead to London. Individuals working in at least six national football associations are being examined as part of the investigation into what is believed to be a network of criminals working out of Singapore and Malaysia, and with links to Eastern Europe, who have been attempting to corrupt matches for at least three years. The systematic nature of the suspected fixing operations has raised concerns that matches in international tournaments, including the forthcoming under-17 and under-20 Fifa World Championships, due to be held during the summer in central America, could be vulnerable. The Fifa investigation centres on Raj Perumal, who until February operated from a flat in a new apartment block in the Wembley City development, within sight of the distinctive arch of the national stadium. Convicted for match-fixing in Singapore in 1995, Perumal has a string of subsequent convictions for theft and violence in his home country. He fled Singapore in July last year after he was sentenced to five yearsâ€™ â€œcorrective trainingâ€ in jail for running over an auxiliary police officer. Perumal has been linked with a number of suspicious international matches. In 2009 he was named as having arranged a number of games played by Zimbabwe in south-east Asia, some of which the Zimbabwe FA believe were fixed. Last September The Daily Telegraph revealed that he was responsible for staging a notorious game between Bahrain and a fake Togo team. Fifa investigators are understood to have linked him to two internationals staged in Antalya in February that are the subject of Fifa disciplinary action following suspected match-fixing. Perumal is in custody in Finland after being arrested on Feb 25. Initially held on an immigration offence, he is now under investigation for his involvement in alleged match-fixing in the Finnish domestic league. He is being held on suspicion of bribing players to fix matches and in connection with an attempt to pay $300,000 to a Finnish club. Eleven players have been arrested and face charges. Perumalâ€™s flat, in the Quadrant Court development at Wembley, was raided by officers from the Metropolitan Police in March following a request from the Finnish police. The flat was empty when police raided it. Chandra Ratna, an associate of Perumal, told The Daily Telegraph that he had been asked to clear the flat by Perumal and said that he had thrown its contents away. Telephone records seized by Finnish police are understood to reveal that Perumal has a wide network of contacts in world football and the UK. Investigators are now trawling these links, which include more than 60 listed contacts in the UK and evidence of contact with senior figures at international federations, sports marketing agencies and current and former international players. Perumalâ€™s arrest is one of a number of significant developments in recent months that have enabled investigators to make progress in understanding the spread of match-fixing. Finnish police and the Fifa investigators are understood to have established that Perumal was responsible for planning a four-team tournament in Sharjah in March, and that it may have been a target for corruption. 1-1, with both goals penalties awarded in the first 37 minutes. The second penalty was missed but retaken. In February, Fifa opened disciplinary proceedings against six match officials involved in two highly suspicious international friendlies in the Turkish resort of Antalya. All seven goals in the games between Bolivia and Latvia, and Estonia and Bulgaria, were penalties, and betting records are understood to reveal surges of activity in legitimate markets before each goal. Three Hungarian officials and three from Bosnia have been banned for life by their respective football federations. The games were arranged by another Singapore businessman, Anthony Santia Raj. The revelation of Fifaâ€™s investigation comes as a German court prepares to hand down sentences in the largest case of match-fixing ever to come before a national court. Ante Sapina, a Croatian match-fixer, is expected to be jailed for his part in co-ordinating a massive corruption ring that German police believe may have targeted more than 300 European club and international matches in the last five years. Sapina is one of seven defendants charged with fixing 47 matches including games in several European leagues, the qualifying rounds of the Champions League and a World Cup qualifying game. Sapina, who was jailed in 2006 for bribing a German referee, was bailed last month after co-operating with prosecutors in the case. He is expected to receive a sentence of around six years. The Bochum investigation has proved another rich source of information for the Fifa investigation, with wire taps providing evidence of apparent links to Singapore and a number of legitimate betting companies.